We present rISk-arounD, an enterprise-wide framework for modeling risks and workarounds in conformity with ISO 9001. The mode of inquiry is the canonical action research (CAR), conducted in a metalworking company. 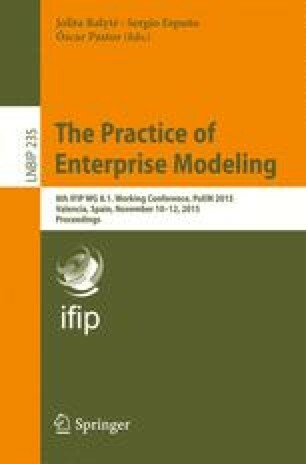 Our contribution suggests that (1) risks and workarounds should be jointly considered to model uncertainty in organizations, (2) participative enterprise modeling can assist process improvement and regulatory compliance, and (3) it is also necessary to address informal “shadow” practices in enterprise models. Moreover, we discuss how to adopt CAR to promote a culture of participative enterprise modeling. This framework can help organizations in their transition to the new 2015 version of ISO 9001, which endorses process oriented approaches and risk-based thinking as top priorities. The authors thank the three reviewers for their comments and ideas to improve the paper. This work has been partially funded by European Regional Development Fund (ERDF), within the National Strategic Reference Framework (NSRF) – Mais Centro.